The title of Hartford Stage’s season opener belies its content. When you hear the term “make believe,” it invokes feelings of folly and delight. Bess Wohl’s world-premiere play of the same title, however, is anything but child’s play, but bravely successful in its portrayal of the effects of childhood experiences. The 90-minute play is told in two parts: the characters as children and then as adults in present day. The children grow up during the 1980s, the height of the “latchkey kid” era where both parents work outside of the home and children often are unsupervised after school. 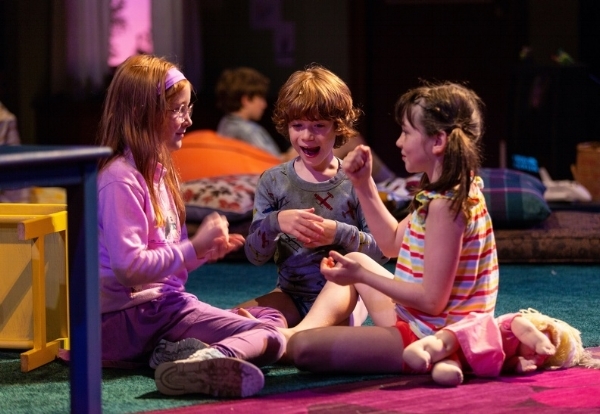 The older children – Kate (Sloane Wolfe) and Chris (Roman Malenda) - have arrived home from school with no sign of their mother; the younger children, Addie (Alexa Skye Swinton) and Carl (RJ Vercellone) seem unphased. Their father is away on a business trip, a frequent occurrence. They’ve been told to not answer the phone or the door while no one is home (stranger danger! ), so the children are left to fend for themselves for an undetermined amount of time, as their mother doesn’t return to the home. The present-day portion of the show takes place in the same home. It reveals how the children – now adults – have managed their feelings after their painful childhood. The theme of parent-child relationships and the aftereffects is nothing new, but Wohl tells it in a way that is upfront and unapologetic, but smart. She knows that the only way trauma is palatable to the audience is seeing it reenacted by children playing “house”; we see the children’s experiences through the filter of play. That lens can often be how children carry those memories into adulthood as a way of handling truths that they are not ready to confront. Wohl gives us a wallop of a show that will leave you awestruck and devastated, which to me signifies a remarkable success. Ms. Wolfe as young Kate is the most genuine of the child performers; she embodies the role of the eldest daughter perfectly: authoritative, rule-follower, and focused on achievement. I wanted more from Mr. Malenda; his performance is uneven with exaggerated and unfocused moments. Given he feels he needs to carry the burden of his siblings’ plight needed to be more evident in his performance. Brad Heberlee’s authentic portrayal as stoic businessman, Carl, leads to one of the most exposed and heartbreaking moments I’ve seen at Hartford Stage. Chris Ghaffari’s performance as Chris is real and nuanced, his best I’ve seen to date. Megan Byrne portrays adult Kate as encased rage under a veil of skin while Molly Ward’s adult Addie is still child-like and lost in a way, raising a daughter of her own. It is obvious that the playwright and director, Jackson Gay, worked closely together on this show. Given its subject matter, credibility and flow of action are integral to this work, and the fact that both are strongly present in this production is a direct result of their intimate collaboration. The scenic design by Antje Ellermann is a 1980s child’s dream come true. Symbols of the 1980s abound with Cabbage Patch dolls, Pound Puppies, Star Wars flyers, Fisher Price playsets, and an Atari 2600 console, complete with sound effects from the game, Asteroids… and yes, I recognized it by sound. Posters from period movies adorn the walls. It is masterful in its detail and accuracy. Fair warning: this is a play that will be difficult for parents to watch. Knowing how our actions can affect our children permanently and profoundly is difficult for many to swallow. While the scenario presented here is extreme and (I presume) fictitious, it still demonstrates how what we do in front of our children will shape who they become. And often few people want to take on the burden of that kind of responsibility.